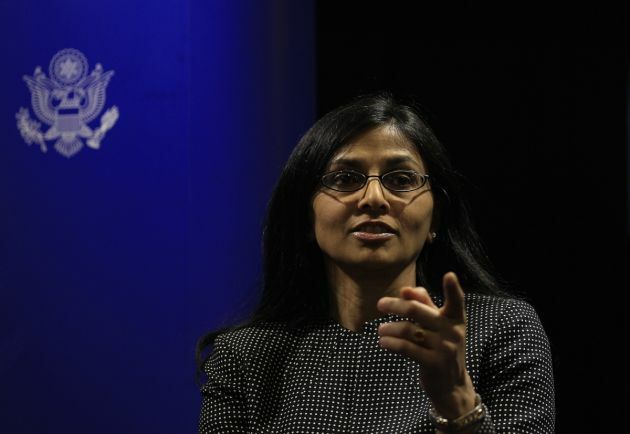 (Photo: REUTERS / Dinuka Liyanawatte)Nisha Desai Biswal, U.S. assistant secretary for South and Central Asian Affairs, gestures during a news conference in Colombo February 1, 2014. The United States will sponsor a resolution against Sri Lanka at UNHRC meeting in March to promote post-war reconciliation amid a frustrating human rights climate and weakening of the rule of law in the island nation, a top U.S. official said on Saturday. The final few months of the 26-year conflict were by far the bloodiest, and the government and Liberation Tigers of Tamil Eelam (LTTE) rebels blame each other for the deaths of tens of thousands of mainly Tamil civilians. COLOMBO (Reuters) - The United States will table a U.N. human rights resolution against Sri Lanka, a State Department official said on Saturday, putting new pressure on Colombo to address war crimes allegations. The United Nations has already called on Sri Lanka to punish military personnel responsible for atrocities in the civil war that the government won in 2009, and Washington says the human rights climate on the island is worsening. "Lack of progress in Sri Lanka has led to great deal of frustration and scepticism in my government and in the international community," Assistant Secretary of State Nisha Biswal told reporters in Colombo after a two-day visit. "There hasn't been sufficient action taken by the government to address the issues of justice and accountability. We heard from many people about people who are still unaccounted for, whose whereabouts and fates are unknown to their family members." Biswal declined to say what would be in the resolution to be tabled at the March session of the U.N. Human Rights Council, but U.S. Embassy officials have said it may call for an international investigation in Sri Lanka. "We understand growing concern, frustration, and scepticism among many in my country and many in the international community that has led to increasing calls for international investigation and an international process." Biswal said. President Mahinda Rajapaksa's government, which finally crushed a 26-year rebellion by the Liberation Tigers of Tamil Eelam (LTTE) in 2009, has rejected calls for an international inquiry and said repeated requests from overseas were to please the large Tamil diaspora in the West. A top Sri Lankan official said in Washington last week that an international inquiry into war crimes would bring "chaos" and insisted that the government's national reconciliation process must be given several more years to work. Biswal acknowledged the reconciliation process needed more time, but said credible steps had to be taken now. "The culture of deterioration of human rights gives us great concern when churches and mosques are burnt down and people feel that they cannot practice their faiths freely and without fear. Then I believe the urgency that has gripped the international community is justified," she said. Britain's Prime Minister David Cameron has said he would push for an international inquiry into war crimes allegations if Sri Lanka does not conduct its own probe by March. Some Sri Lankans who met Biswal told Reuters that they had told her an international process was essential. "We do not have confidence in a local investigation because that would be done by the military, who are accused of war crimes," one activist from northern Jaffna peninsula told Reuters on condition of anonymity. A U.N. panel has said around 40,000 mainly Tamil civilians died in the final few months Of the war. Both sides committed atrocities, but army shelling killed most victims, it concluded. Separatist Tamil Tiger rebels renowned for the use of child solders and suicide bombings battled government forces from 1983.